The caves you will visit started out three hundred million years ago, as shells and skeletal remains and other sediments at the bottom of a warm and shallow sea. As the planet changed over millions of years, and earth movements covered and pushed the land up into mountains, the huge pressure and stresses formed the rock, we call limestone. Water has now carved its way over time, to produce a strange and exhilarating playground, for us lucky enough to be able explore them. 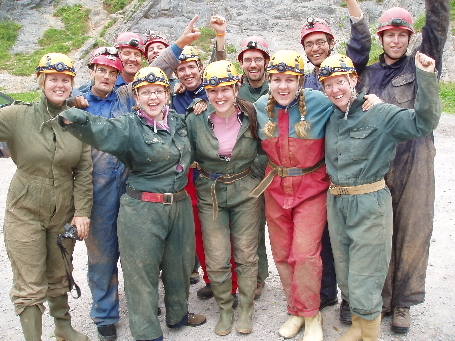 Goatchurch Cavern Is a good introduction to the little known and misunderstood sport, Caving. It has two entrances, one called Tradesman’s Entrance and the other called Main Entrance. The Main Entrance was opened as a show cave in 1901, and the remains of iron railings can be seen. Archaeological finds from the Pleistocene (by Willam Boyd Dawkins c. 1860) included bones of Mammoth, Hyaena, Bear, and Cave Lion. The cave has a number of sporting aspects, Short climbs, crawls, squeezes (that can be bypassed) as well as large passages and very large chambers to walk about in. In many areas of the cave numerous speleothems cover the walls and floors, stalactites, stalagmites and flowstone etc. If we are lucky we may see a bat, or other cave wildlife. We start this trip by climbing in to the stream way and following it down waterfalls to enter some very impressive passages and chambers. 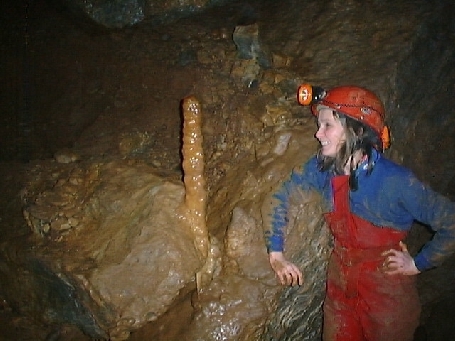 This cave has some of the most impressive cave formations some of you may ever see. With long curtains, stalactites, stalagmites and flowstone that fills some of the passages up so much that some times we have to push between then. The stream can get quite big in wet whether and the waterfalls roar under the power, but this only adds to the fun! And you will get wet. Explore over 500 meters of exciting stream passage, With climbs, waterfalls, and impressive well decorated side passages and chambers.